My most treasured emails I receive are the “It’s working! !” updates I get back when people begin to harness the power of positive reinforcement. I adore each tiny (or not so tiny!) hurdle that is accomplished, each new pathway to a better relationship that is created. 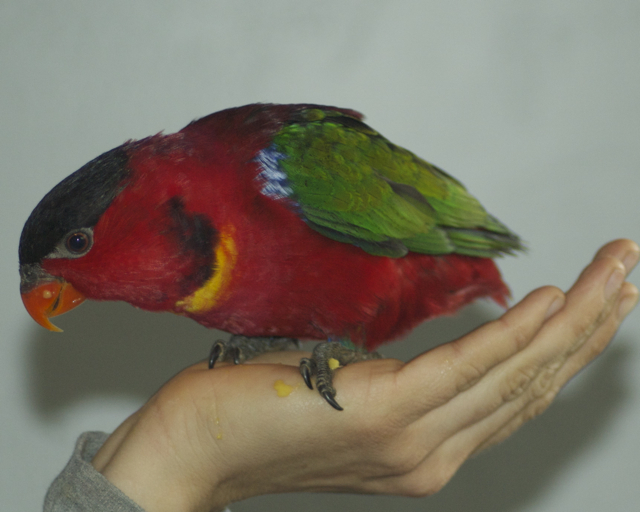 Earlier this year, I had the opportunity to check out a bird who really needed help. Barbara Crouse of Parrot Education and Adoption Center (PEAC) of San Diego called me to help out PEAC volunteer Judy, who was fostering a red lored amazon, Ralphie. 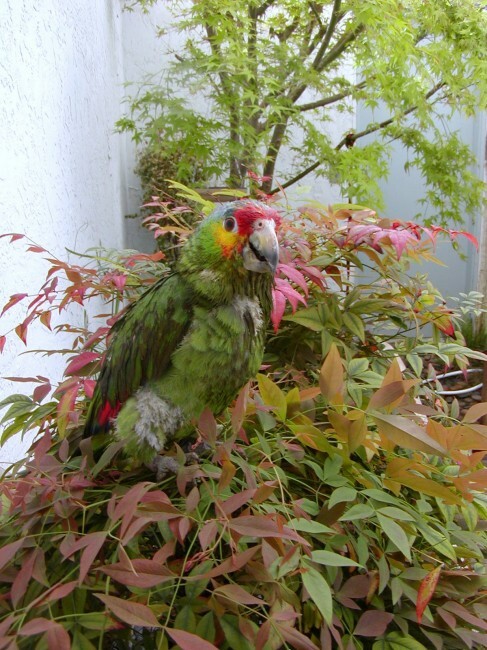 Ralphie is not just any parrot in need of a new home, he was one of the wild, naturalized parrots that live in Southern California, found in a Los Angeles area shelter with a badly broken leg and about to be euthanized. Understandably, Ralphie was terrified of humans and would become incredibly agitated every time his cage was approached. He panted and screeched and showed extreme signs of stress. He would not take food from the hand nor a spoon. In fact, he wouldn’t even eat in front of a human. When I met him, I had to peek around the door to his room to avoid stressing him out too much. Judy and I talked about the different approximations it would take for this bird to learn to be comfortable around humans. What impressed me was that there were no expectations put upon him as to what he should know how to do; we just knew we wanted him to remain calm and relaxed for him to be able to have his cage serviced and food delivered. The first step was just getting him to eat in front of Judy. Instead of playing the game of “chicken” and waiting him out to eat while Judy stayed in the room, we simply started by going out of his sight, make a few slight noises to make our proximity known, and over the course of a many sessions, slowly approximated coming into view and subsequently, in to the room while Ralphie ate his favorite treats. 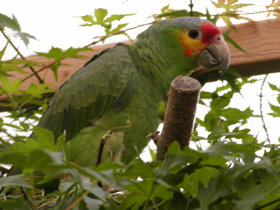 I am a red-lored amazon parrot. I was part of a wild flock of parrots until I got hit by a car. My leg was broken. Someone took me to an animal shelter in Los Angeles. I hurt so bad that I was screaming and screaming for help. The animal shelter was going to put me down but a nice lady came into the animal shelter and she heard me screaming. She asked about me and when the people told her I was going to be put down she said she would take me home. She saved my life! The nice lady phoned Mrs. Crouse in San Diego. 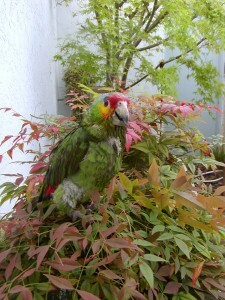 She is the director of the Parrot Education and Adoption Center. Mrs. Crouse helps parrots like me and so the lady in Los Angeles drove me to San Diego. Another nice lady, April Adcock, took me to the doctor and I had an operation. That cost a lot of money! After my operation I went to my foster mom’s house. I had to take medicine. I was so scared! Every time she came near my cage I would scream and scream. But my foster mom fed me good food and pretty soon I started gaining weight. My doctor said my leg was healing but I couldn’t go back to my wild flock because a hawk might get me. Pretty soon I started getting used to my foster family and I stopped being so scared. Now I can get out of my cage and sit on top. I have lots of toys. Every day I get to go outside into my atrium. It is covered so I am safe. I have my very own tree and I like to stay out there all day. I play in my tree and my foster mom gives me good things to eat out there. Did you know I can tell time? Every day at 5:30pm I start making lots of noise. I want all the other parrots to know that pretty soon it will be time to go to bed. I make noise until 7:00 and then I go back in my window and go to my cage. I do it all by myself. I am learning lots of things too. I step up on a stick every time my foster mom says “Up”. I understand the word “peanut”. I am still afraid of hands but I am a very good boy about stepping up on the stick. And I never try to bite! I don’t even pretend. My foster family says that I am very handsome. I am so lucky that the nice lady rescued me. Back to me (Hillary). How is that for a uplifting and empowering story! 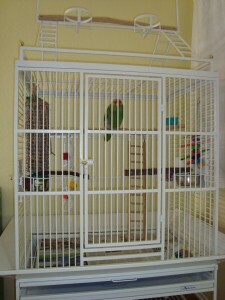 This entry was posted in Success Stories and tagged Amazon parrots, Parrots in the Wild, Scared birds, taming. Bookmark the permalink.